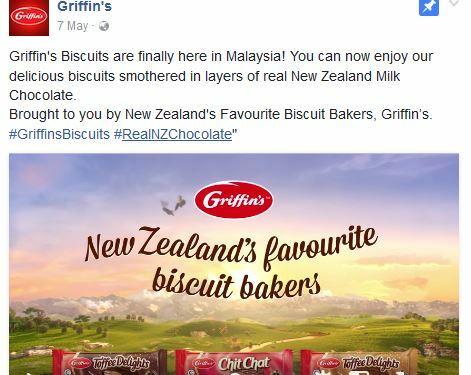 Griffin’s, which has been delighting delighting Kiwi families for nearly 150 years, is now available in Malaysia since May 2017. The Griffin’s Food Company, New Zealand’s biggest snack food producer, was bought by Philippines-based Universal Robina Corporation (URC) in 2014 for USD608 million. For readers in Malaysia, URC owns the familiar brands of Jack ‘n Jill snacks, C2 RTD tea beverages and Cloud 9 chocolate. URC is using Griffin’s to target the “more discerning consumer – middle to upper,” according to Just-Food in December 2015 citing company officials. Griffin’s was launched in Singapore and Thailand in January 2016, followed by the Philippines in July 2016. Griffin’s wrapped bars and chocolate biscuits are imported from New Zealand and sold at a premium over URC’s products in Southeast Asia. 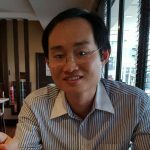 URC President and CEO Lance Y. Gokongwei said the “pack sizes are much larger than what our customers in the ASEAN (Association of Southeast Asian Nations) expect.” The solution is to launch smaller packs for the ASEAN market to make the price point more affordable. Michael Liwanag, Universal Robina Corp, VP Corporate Strategy & Development Group, described this at the Q4 2016 earnings call as the company’s “affordable premiumisation” strategy. In the Philippines, URC introduced four chocolate-coated biscuits and three cookies for kids in July 2016, all at the PHP100 price point. In New Zealand, the Griffin’s Cookie Bear Hundreds & Thousands Milk Cookies come with a pack size of 200g (image below). In Southeast Asia, the same product is selling in a smaller 150g pack (above) – Jaya Grocer in Malaysia. The key marketing strategy adopted by URC for Griffin’s is to associate the brand with its country of origin – New Zealand. The provenance strategy reinforces consumer image of New Zealand for its excellence in dairy (“lovingly baked with real New Zealand milk”) and “clean, green and authentic”. The brand is also marketed as “New Zealand’s Favourite Biscuit Bakers” to drive in the message of heritage and trust. 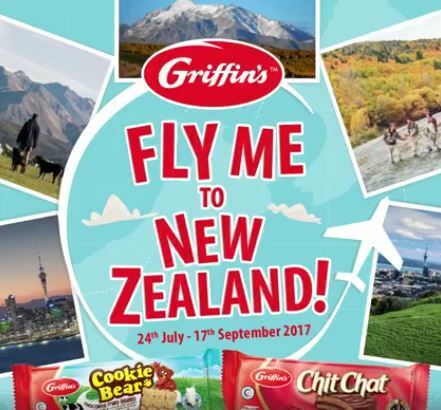 In Malaysia, customers stand a chance to win 2 flight tickets to New Zealand as well as cash prizes and delicious Griffin’s goodies. In the Philippines, apart from engaging with bloggers, URC also made available Griffin’s Chit Chat for guests staying at selected GoHotels in the Philippines. GoHotels is the budget hotel brand of the Gokongwei family’s Robinsons Land Corporation (RLC). Gokongwei owns URC. 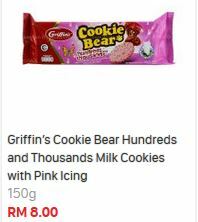 Griffin’s offers URC an opportunity to move up the price ladder and offer consumers with something more premium in the sweet biscuit category. The added advantage for Griffin’s is imported New Zealand sweet biscuit is relatively new to consumers in Southeast Asia.